It was difficult, when How to Train Your Dragon first appeared nearly a decade ago, to predict just what the film would grow into. Flash forward to the present day and a third sequel is cinema-bound, multiple TV series have been made and a whole slew of video games has seen players take to the skies on consoles, PC and mobile. With the aforementioned third film nearly here another blockbuster game has landed on consoles. What makes this one different, however, is the fact that this is no adaptation of the new film - it's a brand new adventure, complete with its own characters. That means you get to take a new heroic dragon and rider to the skies! When the dragon sanctuary Havenholme, created by Hiccup and Toothless, is found in ruins, a mysterious new duo emerge to battle the villains who've done the dastardly deed. Scribbler is a scholar who can't remember his past, while Patch is a unique breed of dragon - a 'chimeragon' with strange new powers for you to uncover. 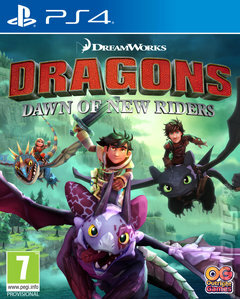 You'll take the dragon and rider to new and familiar islands in your quest for justice, exploring environments such as Havenholme, Valka s Mountain and Blood Briar Island; solving puzzles and doing battle with deadly foes. You can switch between Scribbler and Patch to make use of each character's abilities and, if you're up to it, uncover the story behind Scribbler's lost memories!